The Living Room is the local stage run by locals. The Pride, a production company from the Kootenays, has been running this stage since 2000 and continues to keep the Kootenay artists and musicians involved. 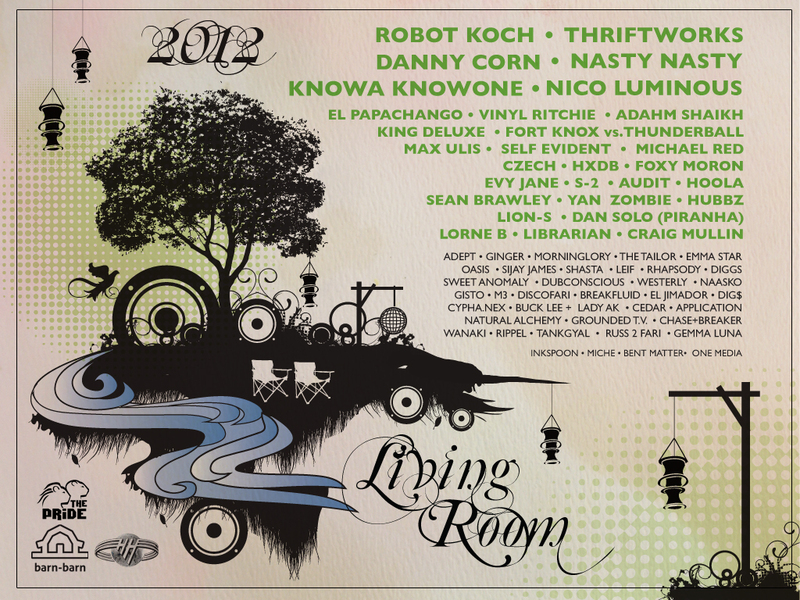 The Living Room always been the “chill stage” more than any other stage, and caters to the more organic and ambient electronic sounds, but is also deeply rooted in funk and dub (without the step). The Pride aims to have mostly Nelson locals help out with the stage which gives it a real “home” kinda of feel. Being located on the water makes it the perfect place to chill when the sun is out or when it gets too crazy everywhere else. 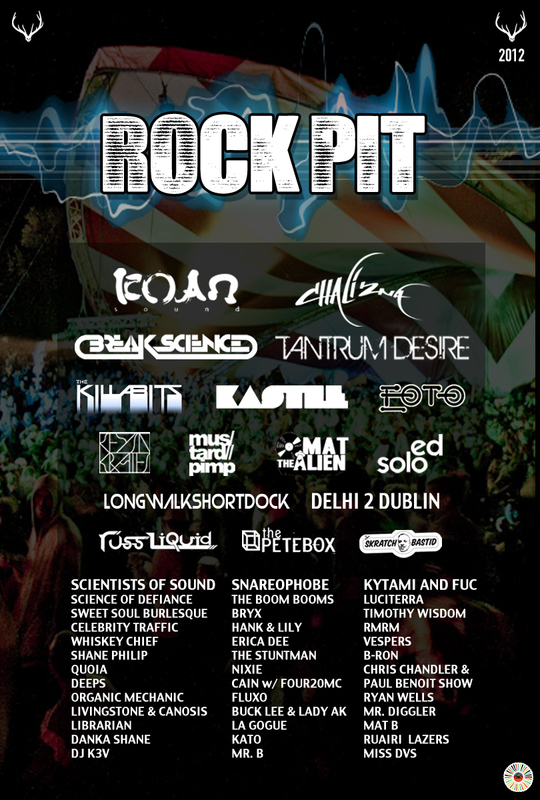 The Rock Pit stage is the one stage at Shambhala where all musical style collide, commingle, and commune. We strive to push Music forward into the future and introduce new talent to our audience year after year. We are not interested in big names but Big Talent with new ideas and creative minds. We believe all style of music are equal under the Rock Pit roof. We remain the Underground of the Underground and Alternative to the Alternative. Like a Rock! Get ready for a new exciting Village Stage for 2012! Since it’s the end of the world and all we figured we might as well blow the roof off and the budget too!!! We are tearing down everything under the big dome for a complete re-design of the stage area. Look forward to an intense new visual environment with the signature Village twist. This year will showcase not only our favorite DJs but also some superb live acts and incredible visual artists! Welcome 2012 with a trip thru the Labyrinth… Discover a mythical treasure of the modern world that reflects the secrets of the ancients. A place to tend to your soul through dance and communication. Choose your journey well… alone or with your entire crew you will feel at home. Pace yourself, dance hard then relax in the Chill zone. This year has produced a wide range of styles. From ol time Blue grass to pure techno!! Whatever your into, our international line up is sure to take you there. Psy Trance & Psy Dub, Progressive and funky… Tech house, and electro swing, a whirl of world of music… All styles fuse in the Labyrinth as technology and people experiment with each other. 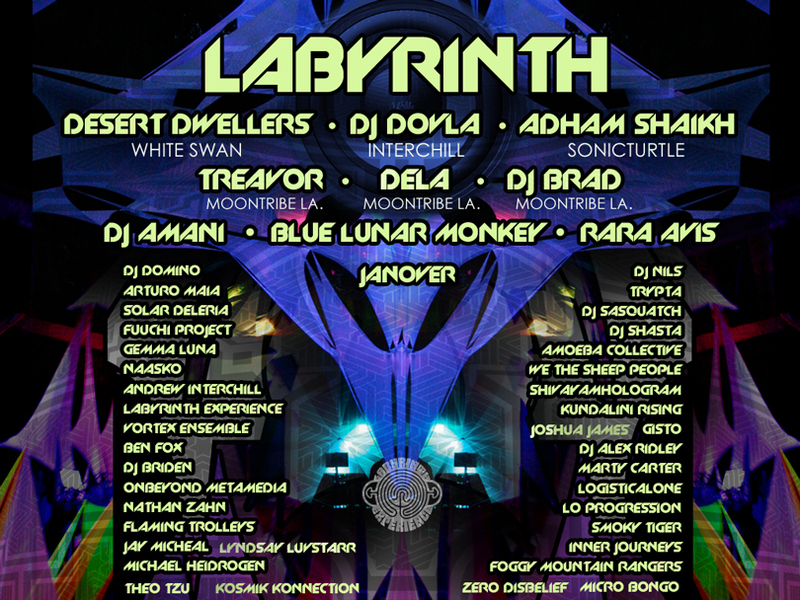 From pure organic sounds to the spooky electric….Uptempo and down… Experience the Labyrinth. Don’t forget to take a stroll in the forest, with its interactive displays, four direction bridge and hands on Art tent. Lose yourself in the myriad of activities day and night. Experience advances in low and high tech tools that you can touch and feel. A chance to interact with the designers and the artists in the Gallery and Chai bar. You can become a muti-dimensional time traveler in the Labyrinth. Just remember… Keep at least one foot firmly planted in all dimensions. Get ready to bust out your best ninja dance moves at Pagoda 2012! We have big changes planned for the temple with a redesigned stage and a MASSIVE new projector. The lineup this year is out of control with some of the best contemporary DJ’s and artists in the world banging over the mountains with PK sound. Get ready for the next level as the most unique stage in the world takes its passengers on a journey into enlightenment. The sacred starship in its 14th year of evolution is pulling out all the stops this year in order to bring you the most amazing audio visual experience ever witnessed. With cutting edge mind blowing 3D Video Mapping of the entire forest environment to spectacular Video DJ sets from none other than DJ Yoda, Bobby C Sound TV, JFB, DJ Woody’s Turntables in Technicolor™ and the premier of The Funk Hunters A/V experience. Expect to see and hear the craziest show ever assembled by the legendary “Team Fractal”. No less than 30 bassbins will be massaging you with 100,000 watts of crystal clear PK sound. Our lighting team have been putting together a stunning new bag of tricks that are sure to melt your mind with eyegasmic sensory overloads while Neon Green will rain down out of the tree tops from the awe inspiring 60 watt Yag lasers that would make even Pink Floyd gush. The Fractal Forest™ is a show within a show within a show. 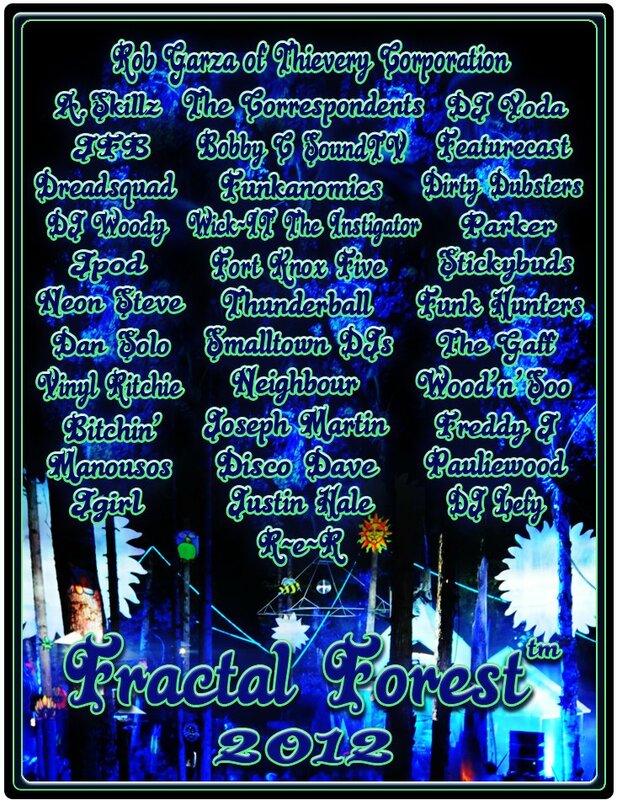 DJ’s play in the heart of the forest out of a burnt out old growth cedar tree stump while being surrounded with 360 degrees of the most beautiful dancers on the planet. Pyramids and flowers are everywhere in the enchanted woodland and if you keep your eyes peeled you may see friendly forest creatures as well as gnomes, fairies and pixies galore. Please join us on the funky spaceship for this epic journey to the 12th dimension and back and your guaranteed to have a life altering conscious awakening, now boarding at 4:20PM, August 10th, 2012 in the Fractal Forest™. This entry was posted in Music, Posts by Britz and tagged 2012, Bass, Culture, DJs, Electronic Music, Fractal Forest, Kootenays, Labyrinth, Living Room, Pagoda, Rock Pit, Salmo, Salmo River Ranch, Shambhala, Shambhalove, The Village, Vibe. Bookmark the permalink. Tantrum desire in the rock pit is going to be insane. INSANE!